I coach executives, managers, project managers and project teams to attain new levels of personal and project performance. Through coaching, we can address organizational politics, team development, group process, interpersonal communication — anything that involves the connections between people. 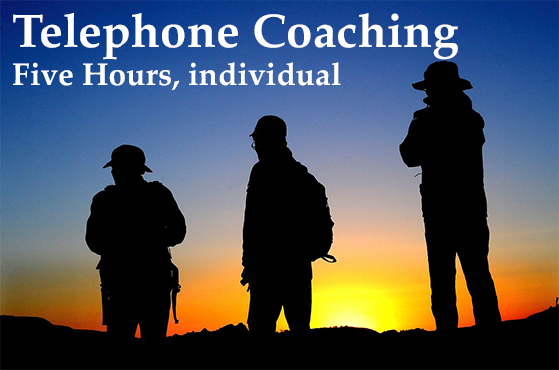 Phone coaching offers a confidential and cost-effective alternative to in-person meetings. And you can use it in blocks of any size. Most clients prefer regular appointments, but clients know they can call me anytime, and if I'm available, we can get right to work. Although you'll see more dramatic results when you're able to establish a close, long-term relationship with your coach, I offer short engagements because it's possible that a short session can make a significant difference, and I want to give you a chance to explore whether my coaching style is a fit for you. Most clients work with me over the phone. For your sessions, just call me at the number below. You're responsible for telephone charges. This item is a service.